As we enter the second week of the International Young Lasallians’ Days for Peace, we find two more powerful videos for reflection. The second is from Brother Arian from the Philippines and is posted on his Facebook. 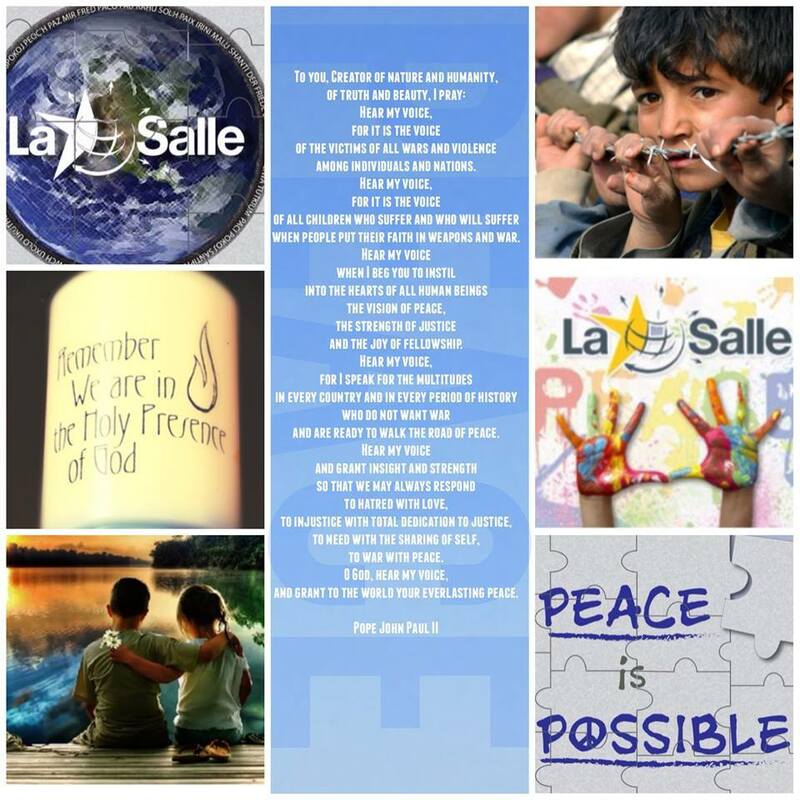 Once again this year the Lasallian World, through the leadership of the International Council of Young Lasallians, is calling on all Lasallians to join in the International Days of Peace that run from 21 September-21 October 2014. The theme for the month is: Breaking the Cycle of Poverty to Build Peace. One hundred years after the start of World War I, the War to End All Wars, peace still eludes our planet. 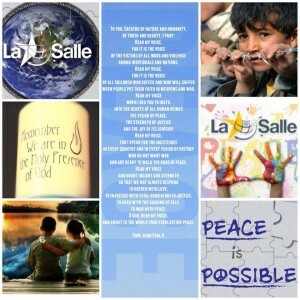 That is why these International Lasallians Days for Peace are so important for our world-wide Lasallian Family. Some of you and your families live in the midst of great conflict and suffering. You have a special place in our prayers. You can speak so eloquently to all Lasallians about the desire for a universal peace. Over these next few weeks each Lasallian and each Lasallian ministry is invited to find ways to build peace, to break the cycle of poverty, to confront violence whether in our city streets or in faraway Syria and Iraq, to ask ourselves the difficult questions about the connections between poverty, deprivation of civil and personal rights and violence, to focus critically on violent responses to violence without weighing the consequences of such responses, and to consider the role of Christian pacifism in peace-making. 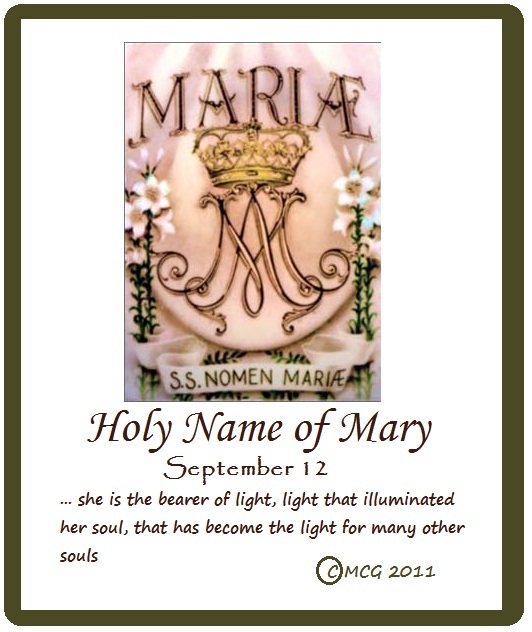 AND--we are challenged to pray using this video. At this time 9 years ago I was experiencing a lot of the same feelings of uncertainty and anxiety that a lot of you were probably feeling a couple weeks ago at the start of the new school year. Whether you are starting your freshmen year and you’re nervous about being at a new school or if you’re a senior and you’re nervous about the reality that this is your last year at La Salle and you need to start planning for the future, we all probably felt some level of uncertainty. I was feeling those same feelings 9 nine years ago when I started off my freshmen year at the University of Oregon. Having graduated from La Salle Academy 3 months earlier, I was now over 3,000 miles away from home and only knew a few students out of the almost 25,000 that are enrolled there. When I first made the decision to go to Oregon, I was full of excitement and anticipation of what I was sure to be a wonderful four years. I was going to be on the track team in a city that is referred to as Track Town, USA so that alone was enough to make me excited. However, after a week on campus, reality began to set in. I was far from home, I was learning how to balance a full course load with being a college athlete, and being an introvert, I was trying my best to meet people and make new friends. A lot of times when we start feeling anxious we begin to doubt ourselves and the decisions we make. This happened for me after my first week of college. I was beginning to question whether going to college across the country was the best decision for me. These thoughts of uncertainty where filling my mind as I walked from class to practice on the Friday afternoon of my first week. We had a lifting workout scheduled for that afternoon and because of the way that the schedule was set up, we would often lift with the football team. So as I was walking into the building where the weight room was located something caught my eye. 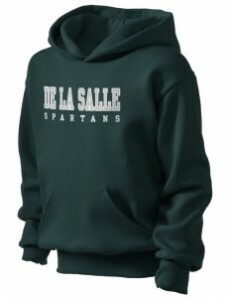 I saw a football playing wearing a sweatshirt that said De La Salle on it. This stopped me in my tracks because it was the first sign of home that I had seen all week. And for me it couldn’t have come at a better time. Seeing La Salle written on a sweatshirt not only served as a reminder of home but also reminded me of something that I had learned while I was a student here, that God is always with us and is there to support us and love us when we need Him the most. He didn’t leave me just because I had gone from a Catholic high school to a state University. And just as He had been present in my four years as at La Salle, I knew that He would be there to support me during my four years at Oregon. 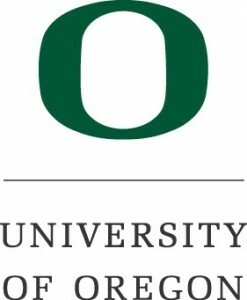 This reminder of God’s love served as a turning point for me and I went on to thoroughly enjoy my four years at Oregon. 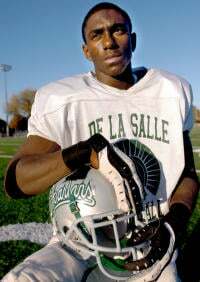 I also eventually found out that the sweatshirt was being worn by a football player who had attended De La Salle High School in California and his name was Cameron Colvin. Some of you may recognize this name from the Sony Picture movie that is currently in theaters called “When the Game Stands Tall.” The movie focuses on Cameron and his high school football team that won 151 straight games. It also features the struggle that Cameron and some of his teammates went through as young men growing up in an area with poverty and violence, most notably the loss of one of their teammates due to violence. Also portrayed in this movie is the love and support that is felt through a Lasallian education. It was because of this that many of the young men who graduated from this school were able to move on and live fulfilling lives. This is the same love and support that I felt during my time here as a student and that also carried through to my college experience and that I still feel today. God stands beside us through any struggles that we are going through, whether it be something small such as feeling homesick or something large like losing a friend at an early age due to violence. As long as we open ourselves up to God’s presence in our lives, we can surprise ourselves with the challenges that we can overcome. So as you go through your time here at La Salle make sure that you open your heart to God’s love and use His support to get through any tough times that you may experience. 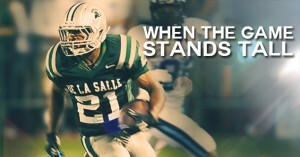 Earlier this week Cameron posted a status on Facebook that read “What good is God’s gift if you don’t work and put it to use.” So during your four years here at La Salle don’t be afraid to use your God given talents, even if things don’t turn out as planned, God will be there to support and carry you. Students viewed this beautiful video created by a Religion teacher at La Salle Academy. 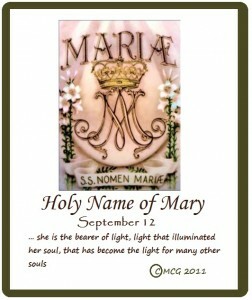 The video presented to students in a prayerful way the theological significance of Mary, Mother of Jesus. Once upon a time a young Native American brave was walking through a mountain pass and found an eagle’s egg. 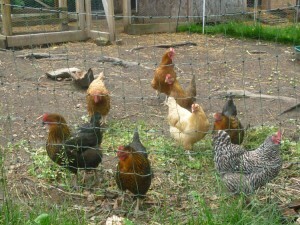 Not knowing what it was he put it in a nest of a barnyard hen kept by his tribe. The eagle hatched with the brood of chicks and grew up with them. Years passed and the eagle grew very old. One day he saw a magnificent bird high above him in the cloudless sky. It glided in graceful majesty among powerful wind currents, with scarcely a beat of its strong golden wings. “That’s the eagle, the king of the birds,” said his neighbor. “He belongs to the sky. We belong to the earth — we’re chickens.” So the eagle lived and died a chicken, for that’s what he thought he was. What a tragedy! Born to soar into the heavens, but conditioned to stay earthbound, he spent his entire life pecking at stray seeds and chasing insects. Though destined to be among the most awesome of all creatures of the air, he believed his neighbor’s counsel and never understood that he could have joined those majestic birds in the sky. All too often we are like that eagle. We believe what our family or friends or teachers or the media tell us about ourselves: you’re too dumb or you’re too fat or you’re too nerdy or you’re too poor or you’re a punk or you’re a troublemaker or you can’t sit still or you will never make it in college or you can’t sing or you’re not an athlete, etc., etc., etc. Yet, within each of us is a special, unique gift, a gift given to us by God our Creator. And that gift is to be an eagle—to soar, to dream, to take risks. 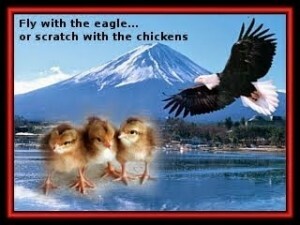 Unlike chickens, eagles are raised to be risk-takers. 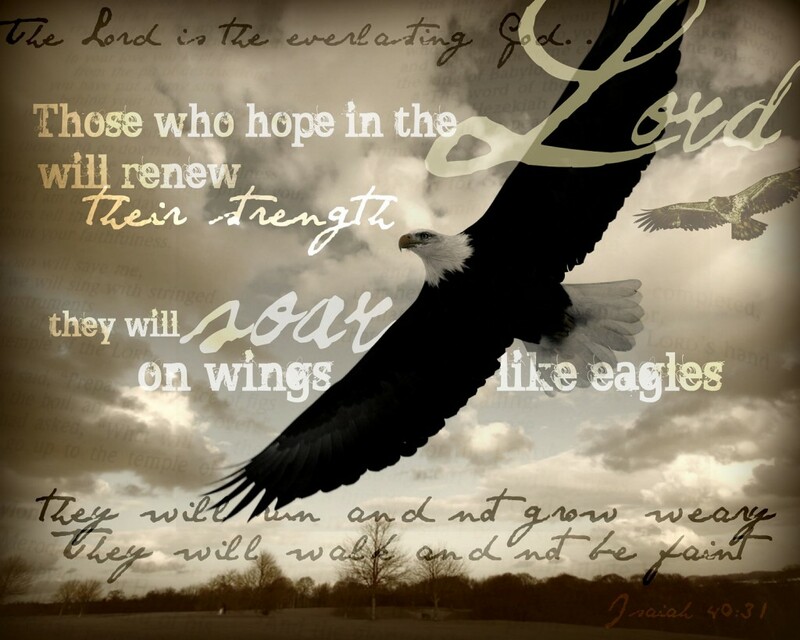 Eagles are raised in a manner that readies them for any storm they have to face. To convince the little eaglets that the time has come to leave the nest, the parent eagles “stir up the nest.” They make the nest very inhospitable, tearing up the “bedding,” and breaking up the twigs until jagged ends of wood stick out all over like a pin cushion. Life for the young eaglets becomes miserable and unhappy. Then the mother eagle pushes them off the cliff where their nest is located into the air. As they shriek in fear, the father eagle flies out and picks them up on his back before they fall, and brings them back to the cliff. This goes on for some time until they start flapping their wings. 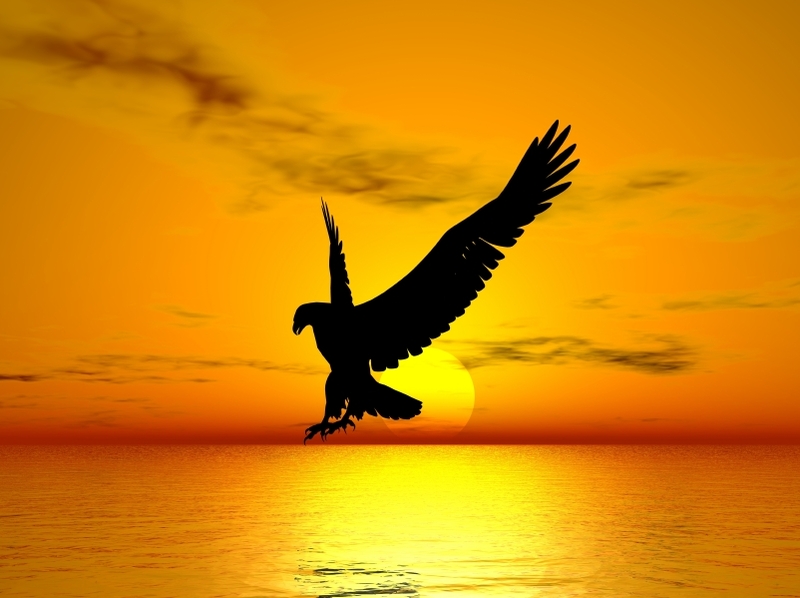 People who soar like eagles are risk takers. They are willing to dare mighty things even when it means they may fail. They will not allow the fear of failure to rule their lives. 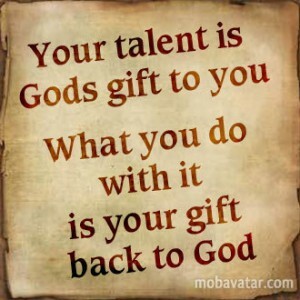 They cling to the grace of God and this frees them to try new things. What if we put our whole heart and soul into a direction and it doesn’t work? Whenever we move forward with our dream that is the risk we have to be willing to take in order to live as one who rises up on wings like an eagle. 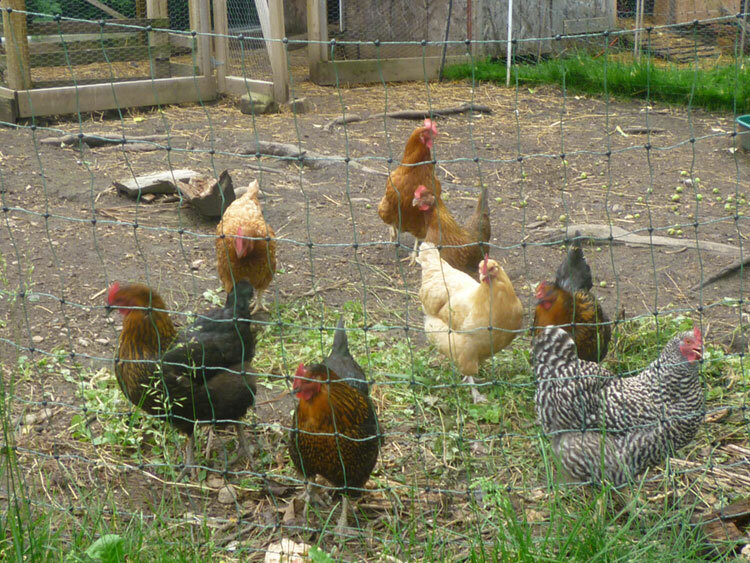 This year will we listen to the false counsel of others and act like a barnyard chicken—a crowd follower, a “squabbler” fighting for a grasshopper, content to live in the chicken yard, eyes on the ground, scratching in the dirt, never trying to fly—an earthbound bird? OR will we discover the eagle within? 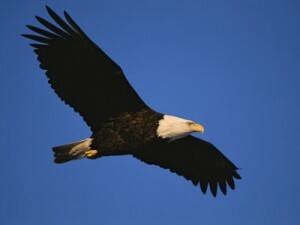 Let us pray: Lord, you have created each of us to be an eagle—to soar mightily, dream deeply, take risks courageously. 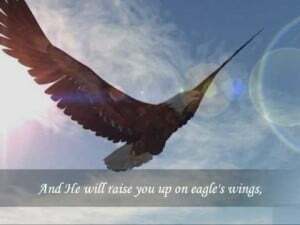 Be for us a father eagle who is there to catch us if we fail and to bring us back to the cliff to try again and again and again. AMEN.